This wonderful organic cotton double duvet cover from Natural Collection is as simple and pure as it can be. Light and soft with a subtle stripe and lovely sheen this luxurious addition to our organic bedding range is suitable for even the most sensitive skins. Oxygen white - naturally whitened with no chlorine or optical brighteners. Please note: this bedding is naturally whitened with no chlorine or optical brighteners and therefore is not a ‘true’ white. 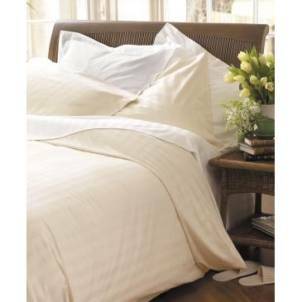 The Natural Collection Organic Cotton Double Duvet Cover - White product ethics are indicated below. To learn more about these product ethics and to see related products, follow the links below. Very soft and comfortable to sleep on. There are currently no questions to display about Natural Collection Organic Cotton Double Duvet Cover - White. Here at Natural Collection, we've been supporting sustainable production, ethical innovation and green ideas since 1999. Our range is an ecologically considered collection, which highlights the importance of consumer choice in the belief that we all have huge power and responsibility to change the world according to what we choose to purchase. The Natural Collection range is produced in harmony with the natural world, harnessing nature’s benefits without exploiting her resources. We believe in responsible manufacture, from the gathering of environmentally friendly organic and recycled materials, right through to considerations of later recyclability and biodegradability.